The chances of the bumper harvest predicted by the USDA is zero. The US harvest won't be a complete disaster, but they will be down on last year (my guess is lower by 10%). Wallacesfarmer.com reports about awful harvest. Harvest so far has been about as awful as the new Bob Dylan Christmas album. Typically USDA's November yield forecasts increase, but this is not a typical year, as freezing weather has dinged yields and caused major crop quality problems. A colleague of mine sent me some snapshots of an Iowa farm that had seven inches of snow last Saturday. Northern Kansas had over 10 inches of snow. 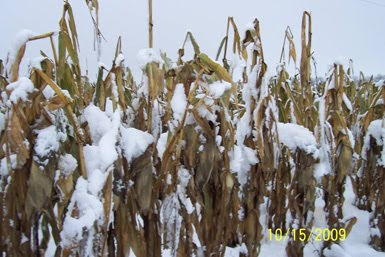 The white stuff melted, but it's a nasty example of what a difficult harvest it has been throughout most of the Corn Belt. We still see green corn here in Central Illinois, and it's nearly November! Iowa farmer Mark Jackson also sent some snowy pics. "We combined these beans (below) three days later on Oct 13 in a six hour window of opportunity, at 14% moisture, before receiving yet another drizzly system of showers," he says. "The yields have been exceptional on our no-till bean crop this fall though we are easily two weeks behind schedule. Corn has its own concerns, with moistures stable in the low to mid 20%. Tom Waters, who farms near Orrick, Mo., says, "We have seen some pretty moldy corn in our area. So far, I haven't seen it in any of my fields. I'm keeping my fingers crossed." Waters says yields have been good, but they are probably 45 days behind normal schedule. "I am sure recent rains are going to be working on the test weights," he adds. "We have had killing frosts that caught some of the late planted beans." Farmers want to know why prices aren't reflecting hard times at harvest. "Here in the Mississippi Delta, a large number of bean and rice acres will never be harvested due to rain and flooded fields," says Bryan Palmer. "I speak to a number of people throughout the U.S. each day and have gathered that Midwest corn and beans will be off as well." Late planted rice in Mississippi, Louisiana, and Missouri already shows "blanks" in the rice heads. North of Highway 82, rice has started to spout in the field, says Palmer. "A number of bankers I have talked with are saying combines will not harvest soybeans due to the damages from rain," he adds. "Soybeans have started to sprout in the fields and damage, two weeks ago, was in the 50% to 70% range. The Clarion Ledger reports that Mississippi harvest in ruin. Unseasonably heavy rain is forcing farmers to leave their crops in the fields to rot, costing them an estimated $377 million. The soggy weather conditions, which have kept tractors out of the fields, eventually could force some farmers out of business. Only a small percentage of the 3.6 million acres of row crops - cotton, soybeans, sweet potatoes, corn and rice - was harvested before rain soaked and flooded fields throughout the state. "I'd say 90 percent of farmers are not done with harvest," said Leland farmer Kenny Fratesi, who planted about 4,000 acres of soybeans. "Don't many want to talk about it (the crops)," he said. "It's too depressing." Before the damage, five crops had an anticipated value of about $1.7 billion, Mississippi State University extension service records show. Considering decreased yield and quality, that value has been downgraded to around $1.3 billion. Soybeans, the state's largest crop, take up about 2.2 million acres and before the rainfall had an estimated value of $700 million. John Michael Riley, an MSU extension specialist, estimates that value has fallen to $537 million. The News Star reports that Louisiana Farms suffer crop disaster. Northeastern Louisiana farmers finally saw the sun Friday afternoon, but it might be too late to save the bulk of the soybean, cotton and sweet potato crops. "It's pitiful," said Caldwell Parish producer Drew Keahey. "I think it's going to be worse than last year." And that's saying something, considering Hurricane Gustav caused more than $1 billion in Louisiana agriculture losses last fall. But some parishes, like Morehouse, have received more than 30 inches of rain since Sept. 12, literally drowning crops that were mature and ready for harvest when the rain began. "It's a mess," said Morehouse Parish producer Elton Kennedy, who was pumping water off of his fields on Friday. "I really can't remember a time when weather kept us from harvesting for this long a period of time." Soybeans may have suffered the most, producers said. "The beans for the most part are gone," Kennedy said. "This weather has rotted a bunch of them." "There will be a lot of beans that never come out of the field," Keahey said. Keith Collins, the LSU AgCenter's Richland Parish county agent, said the AgCenter planted a trial field of Group 4 soybeans "that we'll just have to scrap." "The only beans that may be salvageable are the later beans that were planted behind wheat," Collins said. "The quality is just down to nothing." Below are the comments made during the last four days from Agweb's October Crop Comments. 10/16 - Polo, Ill.: "Our driers are getting a pretty good workout," says Illinois farmer Dustin Spears. "The corn is really wet." 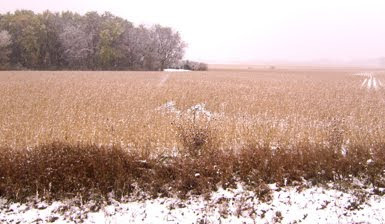 10/16 - Blue Earth County, Minn.: When we quit beans on Sunday, beans were 12.5-12.8% at 40-60bu/ac, and it was snowing. Still have 200ac left. Dried off enough to try some corn Wednesday, took 50ac out. Yield monitor showed 180-200bu/ac, 25-30% moisture, 50-52 test weight. More rain last night & today. Sounds like Saturday & Sunday will be nice, before the next rain system comes in. 10/16 - Southeast Hanson County, S.D. : Combined 64 acres beans first day then 2.5 inches of rain. Several fields are still too green and we had a killing frost 3 days ago which may have damaged some beans. Corn is mature but too wet to dry or bin. More rain forecasted for Tuesday. Fields are too wet which will bog down combines. Beans make 50 B acre, Corn don't know yet as have not been in corn fields yet. 10/16 - Stutsman County, Central Southeast North Dakota: Nobody is getting anything done here! We have had rain earlier and now we have 6 to 8 inches of snow on the ground (Oct. 15). We never finished chopping corn yet, about 3 days to go. Not very many Soybeans have been harvested yet either. Never ever had to chop corn in the snow before. 10/16 - Schuyler County, West Central Illinois: Rain and more rain in west central Illinois in Schuyler County. I had some early group beans to harvest in two afternoons which were the best looking soybeans I ever harvested. Hope the rest of the crop is as good with yields in the 60's. Corn planted the 25th of April tested on October 13th 25.4 moisture and had not changed for over two weeks. SAFE HARVEST TO ALL! 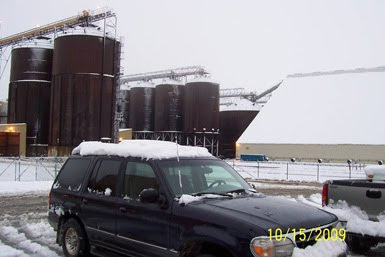 10/16 - Ellendale, N.D.: 5 to 6" of snow in Enderlin. Some power outages, some vehicles in the ditch, some buried soybeans. 10/15 - North Central Illinois: We finally started doing corn. I think it will be a while before we can do soybeans. 10/15 - Bartholomew County, Columbus, Ind. : Bean yields are very disappointing. My good low black ground where I usually yield the best crops are my worst yielding. The hilly ground where the excess water ran off is my best. Average around 45 bu. weighed over scales. Another breakeven year, hopefully. Another 1/2 inch of rain on an already too wet ground. With temps in the 40's it's going to take forever to dry enough to get back in the fields. May God bless you all in a very frustrating and trying harvest 09!!! 10/15 - Coles County, East Central Illinois: Still raining. My last field of Trisler 3675 beans planted June 9th only made 42 bu./acre. There was a lot of blank pods on the top half of the plants. they looked as good as my group 3-4 beans (58-64bu/a) until I started cutting them and started noticing the light colored curled up pods that where empty of beans. Wet weather until July 12th then very little rain until Sept. must have hit the fuller season beans during pod fill. 10/15 - Southern Iowa: Just keeps on raining and raining. We have not been able to even put a wheel of the combine in the fields yet. Some guys with mud hogs are out making ruts...but the rest of us just watch and shake our heads. I suppose folks are going to get jumpy and start burying combines here soon. Maybe we will cruise the country side with our chains and 4x4 tractors looking for a little extra work until we can get started! Ha! We are getting worried about the beans popping...hand shelled some 113 day corn and it tested 17.5%...but we can't get to it so I guess why test it?! 10/15 - Faribault County, Minn.: The weather here just plain stinks. Rain and snow every day this week so far, with more on the way. Sunday and Monday are supposed to be sunny, and the next system moves in Monday night. Those that tried corn say it is very wet and light. It is looking less likely we will get everything done before winter sets in. 10/15 - Northeast Arkansas: Corn harvest 75 percent complete yields 180-220...soybeans harvest 10 percent complete yields 45-80...cotton harvest barely started yields no reports...rain has got all crops running 30 days late on harvest...hope for some sun soon. 10/15 - Lincoln County, Wash.: Finally got some rain here. Over 1/2 '' in last 24 hours. Was a blessing since soil moisture was dismal and dust storms too frequent with some of the fields blowing so bad the topsoil drifted making some roads impassable. 10/15 - Bell County, Texas: We are battling army worms in Bell County. We have sprayed for two outbreaks in the last month. 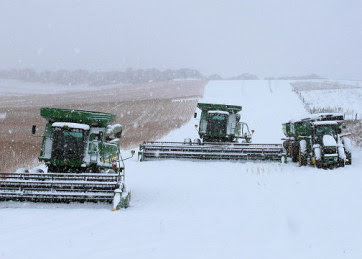 10/15 - Scotts Bluff County, Nebraska Panhandle: Most dry edible beans are safely combined and either sold or stored, but sugar beet harvest ground to a halt after thirteen inches of wet snow fell October 10-11. Corn harvest looks a long time coming with fields and roads awash in mud and snowy slush. This looks to be the kind of year farmers eat their Thanksgiving turkey with one hand, and steer the combine with the other. 10/15 - Stearns County, Minn.: More rain and snow again. Bumper yields out there and NO decent harvesting weather in the future forecasts. This blows. Soybeans are going 50 bushel per acre but corn is still 25-30% moisture and don't dry down at all with crappy weather like this. Time to keep drinking I guess. 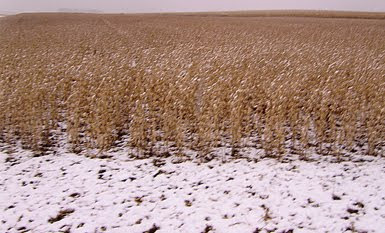 10/15 - Western Walsh County, Northeast North Dakota: We have not been able to harvest anything for 2 weeks. Rain, snow, cold cloudy days, more snow flurries, and temps into the teens have made for a miserable October for getting much done. There is still some wheat left to combine and very few edible beans have come off in this area. Down in the Red River valley, a lot of the edible beans are done, but they have corn and sugar beets to worry about yet. No flax, sunflowers, or soybeans have been harvested around here yet. We are chisel plowing some grain stubble and have several hundred acres of fert. put on, but even those operations are hampered by wet straw, some muddy conditions, and some frozen ground early mornings. Our September weather was truly a gift from Above, as temps in the 80's allowed the late planted crops to make maturity. Now the challenge is finishing harvest. 10/15 - Texas: Following rains, armyworms marched in and devoured improved pastures and wheat throughout the state. But the worst may be over -- or not -- according to Texas AgriLife Extension Service personnel. 10/14 - Sedgwick County (west of Wichita), South Central Kansas: We are now concerned about getting our wheat planted. Looks like only 15% has been planted in Sedgwick and Sumner counties. It has been very wet for the last week and there was significant rain yesterday. We don't have any irrigation, all dry land cropping. Dry land corn was picked a couple of weeks ago and was disappointing at only 75 bu/ac. It looked much better all summer. Looks like a large milo crop in our area! My early planted fields were good even with a weed problem (due to manure) and later plantings look better. Those neighbors that planted milo late (which is not unusual in our area), the crop will not reach maturity prior to a likely freeze. Double crop milo is also behind. 10/14 - Coles County, East Central Illinois: Raining again. Cut beans between rains with moisture in the 14.5 to 15.5 % range. Yields have been disappointing on the RR2 beans. My Trisler RR1 3463 out yielded them by 6 bu. so far and my Pioneer Y beans out yielded them by 4 bu. My Pioneer 93m61 RR1 beans had White mold. Picked some April planted corn with moisture still in the mid 20s and some in the upper 20s. 10/14 - Poweshiek County, Iowa: Had our first ever 70 bu. whole farm soybeans today. Pioneer 93M11. They weren't very tall but they did great. Lots of beans in the high 50's and low 60's around here. We are about a third done with beans and quarter done with corn. Lighter test weights with moisture from 20 to 28%. Everything averaging around 200 so far. BE SAFE!! 10/14 - North Central Texas: Over 2 feet of rain the last month. Most cotton will never be harvested. 10/14 - Redwood County, Minn.: The last 2 weeks received about 5.5 inches of rain, about 2 inches of snow included in this amount. 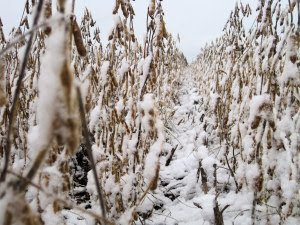 The soybean harvest has ground to a halt, with about 50% harvested. the yields have been from 35-55 bushels per acre. Harvest loss is increasing with the wet soils. The corn harvest is a non event with moisture running from 27%-34%. The growing season has ended with 5 nights in the low to mid 20's. 10/13 - Ross County, Ohio: We have had over 7 inches of rain in the last four weeks and now we are having a hard time getting the beans in. We are seeing excellent yields in our bean crop around 65 bushels. Corn looked great until these last rains but now we are seeing some ears that did not break over are sprouting down at the base of the ear need some dry air to stop this. Have a safe harvest. 10/13 - Lancaster County, Neb. : I would say 40-50% of beans taken out with yields 50-60bu/acre. Very little corn taken out but is going down do to dry conditions this summer, although we had very dry July in this area are corn yields will be above average. Yields are varying 100 bu/acre depending on soil type within the same field. We had 2" of snow on the ground Saturday morning (10th) irrigated corn west of us is still very wet from 25 to 35% moisture ours is 16 to 20% in this area. 10/13 - Southern Ohio: Early beans coming in good but there are lot of late ones that will pull the average down. Heavy rains are bringing on the mud. Corn is still near 30 percent. It is going to be a long fall!! 10/13 - Wright County, Iowa: Finished cutting beans 10/11 @ 10 PM. Woke up to 1" of snow 10/12. Yields were from 41to 60 w/ moisture from 10.5 to 13.5. Lots of beans left in the area. Picked some corn end of last w eek. It was 102 day Dekalb planted 4/16. Moisture was 20 to 23. 173 bpa @ 15%, 51# test wt. Hope the other varieties weigh better. I'll be glad when this harvest is over! Be safe out there and count your blessings. 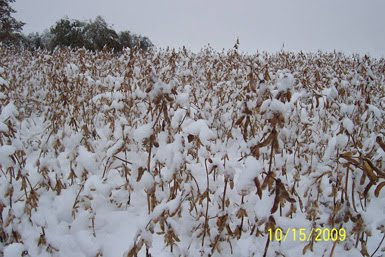 10/13 - Buena Vista County, Northwest Iowa: Harvest at stand still after this snow, more moisture forecasted for most of week, beans yields in the 50's so far, about normal, corn has not been near as good as earlier thought to be by ear counts, still very wet 25% or more with 50 # test weights, I think the speculators are in for a big surprise by the time harvest ever gets on the way or done. 10/13 - Northern Indiana: We have not been able to even get into a field to harvest and weather has only let us plant 20 acres of wheat, the corn is running 28% and bean stems are still green. I think they should rethink the harvest out looks, can't see it being a bumper any thing...with a chance of early snow. 10/13 - Douglas/Ottertail counties, Minn.: Glad that had all wheat and hay this crop season as have snow & wet mud now with very little beans harvested here in Douglas/Ottertail counties. At least have had lots of time to do up the livestock chores and such. Not sure if will have enough feed for beef cows if winter is here to stay & no more fall grazing. 10/13 - Cass County, Neb. : Had 3 inches of snow on Saturday the 10th. Moisture today and cool. Have been cutting soybeans the last two weeks about every other day. Yields have been very good here with whole field averages anywhere from 51 bu/ac to 65 bu/acre. Tried some RR2's this year and after cutting them was very disappointed with them. RR2's were getting beat by 9 to 12 bushel pretty steady across the field. Had the planter split half and half. One half NC+ 3500 RR2's and the other half Pioneer 93M43. Pioneer beans beat RR2's by 11 bushel. That is a huge difference when you figure that one out. Other than that beans have been doing well. Haven't done any corn but the corn being done is yielding very well with reports of 180 - 220 bu/acre coming in. That is very, very good corn for western cass county NE. Everyone have a safe harvest. 10/13 - Southeast Nebraska: After a fast flurry of activity until drying facilities were filled for corn and quite a few soybeans harvested but now rain and cloudy so quite a few rigs are idle. Yields vary but ours are not as good as last year by about 10% due to late planting and cool summer. Most corn moisture until last rain in upper teens and 20s and beans harvested on a few dry days and dry then are running at 15% and above. 10/13 - Odebolt, Iowa: Carol Raasch, of Odebolt, Iowa, says corn and soybean harvest is finally happening after lots of rain and drying time. 10/13 - Brown County, S.D. : Haven't turned a wheel yet for harvest. Approaching 13 in. of rain for Sept. and early Oct. and now it is snowing. Gonna be an interesting harvest if we even are able to get in the field. Good times are gonna be had by all here. 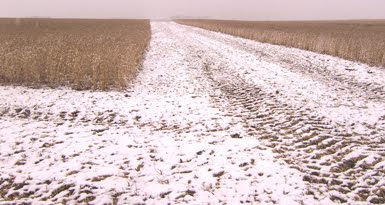 10/13 - North Central Iowa: Combined beans last night until started snowing. Yesterday was first day of beans for almost two weeks. Most have only started with less than 20% of the beans harvested here. Some fields yielded OK but the bad fields with lots of SDS and mold are really pulling our average down. Corn is wet, and I've heard light weight 29% and 50-51#, some stalk rot. Virtually no corn harvested here. My reaction: USDA estimates are wrong. Before the end of the year, the world will wake up to this reality, and prices will start moving sharply higher. Really, having a store of food in case of any type of emergency - natural disaster, nuclear holocaust, economic meltdown - is a good idea. As far as investing goes, it all depends on where you think we are headed; but then again, that's the way it always has been with "investing". Some people saw the 2008 crash and got out ahead of time, the rest of us didn't. Anonymous, the pictures really do tell a tale. a prediction can't be correct 100% of the time anyways. but judging from all the info that's given, i lean toward eric's opinion. it doesnt really have to be "before the end of the year"
i just know its coming.. yeah? Look I been reading Eric's blog for a while now and his whole thesis of a dollar collapse and its acceleration rests on agricultural production and their exaggerated estimates. Eric has even gone so far as to say that America could even default on its soy/wheat, or both, deliveries. Also Eric ties this idea to China where if the dollar should collapse, and cause food in China to inflate, China would immediately drop the dollar peg. These are bold claims no matter how one slices it, and at a time where many economists have stated that the world, America, is rebounding. That the worst is behind us now. If Eric should fail in his prediction it wont be because of the voice of caution that was herald by someone else. As a matter of fact, the blame will rest solely on Eric. Eric's research is solid (he provides the links) and the USDA is projecting a bumper crop. What ever the motive (ie keeping food prices low so you buy more stuff from China at Christmas) it appears there is a conflict in the USDA's estimates. While the timing of price spikes is very difficult to predict, I will agree with Eric in that pressures are building and a food crisis could be upon us in the near term (I consider that to be 0 to 3 years). Unless some truly global bumper crops arrive to restore balance to the market a dissaster is pending. The decline in food inventories has been occurring for a decade and we now sit at multi-decade lows on food inventories according to the USDA's own estimates. Longer term the challenges are even greater. The FAO is running around the world asking governments to increase food production. The UN says we need to double food production in the next 20 years. I think Eric and Jim Rogers are correct. Food prices are going to soar very soon. Will Eric be right about the acceleration timing and the process by which it happens?